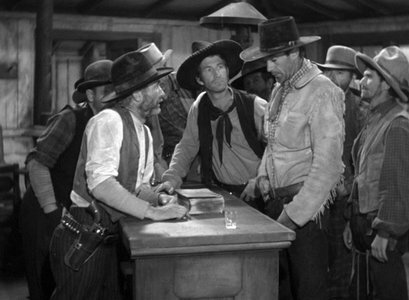 Judge Roy Bean (played by Walter Brennan, left) holds court in his saloon. It’s funny, isn’t it, how sometimes you see a showdown coming. Look – there it is, galloping across the plain, heading straight toward you. Even if you try to jump out of the way, it’ll still knock you over. Such is the case with the 1940 western, The Westerner. Here is a movie packed with conflict, but everything hinges on the relationship between two men – one of whom will have to kill the other before it’s done. There’s no way around it. The Westerner takes place in the American west, in the days when homesteaders began settling in cattle ranching territory. The homesteaders’ fencing and agricultural activities angered the cattlemen because they saw it as an invasion of their range land. This was also the time of Judge Roy Bean, who, according to the movie, “took the law into his own hands”. The weakness in Brennan’s character is his obsession with entertainer Lillie Langtry, a woman he desperately loves but has never met. Lillie Langtry posters fill the wall behind the bar like a shrine. Brennan’s men burst into the scene, toting a stranger by the name of Cole Harden (Gary Cooper), who is accused of stealing a horse. Cooper’s character, a man who can talk his way out of anything, sees Brennan’s obsession with Langtry and starts telling glowing stories about her. Brennan, a shrewd man but a fool in love, suspends Cooper’s sentence so he can “to look into the matter further.” He’s hopeful Cooper can arrange a meeting with Langtry. An unlikely friendship develops between these two men, despite Cooper’s attraction to the daughter of a homesteader (Doris Davenport) and his own growing belief that homesteaders have a right to be in the territory. But he keeps Brennan in check by feeding him fiction about Langtry. There is genuine respect between the two characters, but you know a Bad End is coming. Cooper is a dominant presence in any film, but this film is not his. It is Brennan’s film, and he wears it comfortably. In one scene, Cooper confronts Brennan, saying he’s getting a warrant for his arrest. Brennan snaps, “If you come back with a warrant, you’d better be first on the draw.” He says this without hesitation, and we’re shocked that he could turn on his friend so quickly. We suddenly realize that, while we thought Cooper was fooling Brennan, Brennan was actually fooling us. As he watches Cooper leave to get the warrant, Brennan’s face is a mixture of loss and revenge. “So long, Cole,” he says quietly. His soft farewell hangs in the air, revealing his cleverness; with three little words, Brennan snatches the entire movie. The Westerner is about the old west, but it’s really about motive. All movies are about motive to one degree or another, but this movie drives it like a freight train. There is no getting out of the way until it’s too late. If you are new to the western genre, give The Westerner a try. We think you’ll be adding it to your “Must Watch” list. The Westerner: starring Gary Cooper, Walter Brennan, Doris Davenport. Directed by William Wyler. Written by Jo Swerling and Niven Busch. United Artists Corp., B&W, 1940, 100 mins. Great thoughts on a great film. It’s hard to see Cooper not dominate a western, but in reality he is more of the supporting character here, even if the part is larger. You’re exactly right about Brennan too- it is his from the word go. Cooper supports the brilliance that is Brennen and every time I watch this masterpiece I find myself wishing that these guys could find a way to work things out, just so their screen chemistry can continue. It is weird to see Cooper as a supporting character, but he’s smart enough to realize this ain’t his moment to shine. It would have been awkward if he were trying to steal every scene from Brennan. I think this is my fave Walter Brennan film. Yes, there is so much going on in this movie, you are right to suggest it to people “who don’t think they like westerns.” You can read many things into the plot and Cooper’s character, get some fiction and humor with your history, and Brennan gets to play such a layered character, sympathetic despite everything– not easy to pull off. William Wyler brought to his relatively few westerns (the awesome The Big Country was one) some very interesting character dynamics. Check out Wyler’s Come and Get It for another great Brennan role. Great post, thanks! I will watch for Brennan’s “Come and Get It”, which is one I haven’t seen. Funny you should mention “The Big Country” – I was able to scoop it up in a 4-for-$20 discount bin. Can you imagine! I also agree that “Come and Get It” is a highly enjoyable film, and one well worth watching. There is clearly a reason that Brennan won Academy Awards for these amazing films. I haven’t seen his third award winning role in “Kentucky” (1938), but hope to find it soon. I’ve admired Walter Brennan since I was a kid. We were watching a western and I kept pestering my parents about him. I don’t remember the movie, but I always remembered him because he’s that good. As for the 4-for-$20 bin, I hit the motherlode. I found “The Desert Fox” with James Mason and “The Longest Day”. That deal will never come my way again. What a bargain! Put “The Desert Rats” in their there and I would say it’s about as good as it could get!- I’m feeling rather jealous right now. Ruth, although I’m well aware that Walter Brennan was a 3-time Oscar-winner, I must admit I’m more familiar with his more comedic roles, such as TO HAVE AND HAVE NOT; SUPPORT YOUR LOCAL SHERIFF; and WHO’S MINDING THE MINT? Your moving review of THE WESTERNER really got me thinking. I’m going to have to give THE WESTERNER my undivided attention sooner rather than later! Superb review, my friend, as always! Dor, I have not seem “Who’s Minding the Mint?”. Thanks for bringing it to my attention; will have to check it out soon. Brennan’s a fellow who can do it all, no? Ruth, I totally agree that The Westerner is, in fact, Walter Brennan’s film. I’m sure I first watched it on TV at a very young age – because a terror of Judge Roy Bean was instilled in me early. When I saw the film again as an adult, I understood my “Judge Roy Bean Complex” completely. Thank you, Walter Brennan. Very fine insights into one of Hollywood’s iconic westerns. Wow — It sounds like Brennan’s performance really got to you as a kid, if this was the film you saw. I can see why a young person would have some terror because Brennan is charming one minute and icily revengeful the next. Walter Brennan, “Granpappy Amos, the head of the clan”! It took some getting used to, seeing Walter Brennan in other roles, even though they all predated “The Real McCoys.” I saw the TV show first-run, however, and it took some time before I watched westerns. Years later, I bought my parents a VCR for Christmas and with it hours upon hours of recorded movies. For Mom, I taped her nothing but musicals, for Dad westerns & war flicks. Virtually every night, I’d set up the 2 machines to play & record a movie, go to bed, and start another the next morning before going to work. This was one of the movies I started watching and stayed up to see it finish. And you’re right, as big a presence Cooper was in film, this one belongs to Brennan. What a wonderful present for your parents! And to record movies for them too — such an amazing thing to do. That must have been quite a film library they had. I agree that once you start watching “The Westerner” it’s hard to pull yourself away, even if you are able to record it. Walter Brennan eventually became somewhat typecast, which is a shame because he was a versatile performer as evidenced by his performance in THE WESTERNER. You’re right–he does indeed steal the pic. (Plus, he made a MUCH better Judge Roy Bean than Paul Newman in ’72!). I agree that it’s a shame Brennan became typecast. He had real talent. Most interesting (and I love the title!). It’s true that Brennan was very typecast as time went on – but he is in the driver’s seat here! (But Gary is so darn cute!). Ha ha! I don’t think anyone would disagree with you about Gary. He is rather charming in this film. Walter Brennan is terrific in this film! Then again, he was pretty terrific most of the time. One of the best character actors ever, hands-down. Now you’ve blogged about it. I think 2 mentions in a week has lit a fire under me to get at it. It’s funny because I’ve always liked Walter Brennan since I was young, also, and don’t really remember anything he was in. I love Gary Cooper, too, so definitely need to see this movie, even though it sounds kind of sad. Thank you for bringing it to my attention, Ruth! This movie really is worth it. I hope you get the chance to see it. It’s Brennan’s show, all right, but Cooper is downright adorable in some scenes. Walter Brennan was always a scene stealer but was confined to supporting roles for most of his career, so it was a delight to watch a movie where he is one of the leads. Cooper and Brennan worked so well together that I wish they had done more movies together. Sgt. York was great but Brennan was so subdued, especially compared to the westerner. The only other film that I can think of where he had a leading role was My Darling Clementine, where he was genuinely frightening. As you say, it is definitely a movie that more people need to see. You’re absolutely right about Brennan being confined and when you see him in a movie like this, you almost weep that he wasn’t in more leading roles. I’ve gotta see “My Darling Clementine” again – it’s been too long! Thanks for dropping by.